The choices you make as a driver can have a major impact on fuel consumption and greenhouse gas (GHG) emissions. Choose a vehicle with the most fuel-efficient technologies. Once you’re on the road, make a conscious choice to use fuel-efficient driving techniques, no matter the weather. 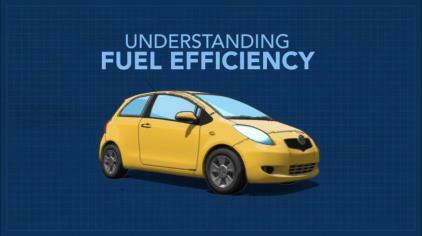 Learn about the five factors that most affect your fuel efficiency when you drive. Let’s take a minute or two to talk about fuel efficiency. The ratings you see – on the windows of new vehicles, and on the web, reflect the results of specific tests done by manufacturers in laboratories, on dynamometers which simulate different conditions. Driving behaviour: Rapid acceleration, speeding, driving at inconsistent speeds and even extended idling can increase your fuel consumption. The smoother you drive, the better your results will be. Drive smarter – and reduce your fuel consumption by up to 25%! Weather: The colder it is, the worse your fuel consumption will be. Poorer driving conditions, more friction, different types of fuel – it all adds up. A drop in temperature from 24 to 7 degrees can increase fuel consumption in urban commutes from 12 to 28%. In the summer, air conditioning robs engine power, and open windows at highway speeds can make your car much less aerodynamic, and that increases fuel consumption too. Weight: It’s a fact that lighter cars use less fuel. For every 25 kilograms of weight you add to a mid-sized car, you’ll worsen your fuel economy by one percentage point. So… lighten up! Aerodynamics: Today’s vehicles are designed to slip easily through the air. Bike or ski racks or cargo boxes can increase your fuel consumption by 20% so don’t keep them on the vehicle unless you’re actually using them. Route planning and congestion: It just makes sense to think about where you’re going… BEFORE you leave. Check conditions and traffic or construction reports, and you’ll save time AND fuel. Here’s the bottom line: while choosing an efficient vehicle is very important, how, where, and when you drive has a big effect on your fuel consumption, and how much you contribute to harmful greenhouse gas emissions. Canada’s GHG emission standards are becoming more stringent, and vehicle manufacturers have responded with a wide range of engineering advancements. These features reduce emissions while saving you money on fuel. Vehicles with these options are available now. Find more information about them at these links. Canada’s climate poses special challenges for fuel-efficient driving. Your vehicle’s air conditioner can be a major fuel consumer, and the cold weather challenges your fuel efficiency for many reasons. Find smart tips at the links below for lowering your fuel consumption – through the hottest days of summer and the worst of winter weather.